The Round Table class, also known as the Sir Lancelot class, was a British ship class designed for amphibious warfare missions in support of the main amphibious warfare ships. They were designated landing ship logistics (LSL). In December 1961, the Ministry of Transport ordered the first in a new class of 6,000-ton military supply vessels from Fairfield Shipbuilding and Engineering Company of Govan. The class was designed to replace the World War II-era Mark 8 Landing Craft Tank vessels in service. The first ship, Sir Lancelot, was launched in June 1963. In March 1963, two more vessels were ordered, with Sir Galahad and Sir Geraint launched by Alexander Stephen and Sons of Linthouse in April 1966 and January 1967. The final three ships were ordered in April 1965; Sir Bedivere and Sir Tristram were launched by Hawthorn Leslie and Company of Hebburn in July and December 1966, followed by Sir Percivale from Swan Hunter of Wallsend in October 1967. At 6,390 GRT, Sir Lancelot was slightly larger than her successors, and was powered by two 12-cylinder Sulzer diesel engines, while the others were 4,473 GRT and had two 10-cylinder Mirrlees Monarch engines. The ships had both bow and stern doors leading onto the main vehicle deck, making them roll-on/roll-off, combined with ramps that led to upper and lower vehicle decks. Thanks to their shallow draught, they could beach themselves and use the bow doors for speedy unloading of troops and equipment. The ships also had helicopter decks on both the upper vehicle deck and behind the superstructure. The ships were operated and managed by the British-India Steam Navigation Company for the Royal Army Service Corps until January 1970, then were transferred to the Royal Fleet Auxiliary. One vessel, Sir Galahad, was lost during the Falklands War, while another, Sir Tristram, was badly damaged. The former was replaced by a new, 8,861 GT vessel of the same name, while the latter was rebuilt and returned to service. All of the vessels in this class were replaced by the Bay class, with Sir Bedivere the last to leave service in 2008. HMAS Tobruk, operated by the Royal Australian Navy, is based on the Round Table design. The ship was originally built for army service, and was taken over by the Royal Fleet Auxiliary in 1970. She was commissioned in 1967 and saw extensive service in many of Britain's naval operations since. Her home port was Marchwood, Hampshire, which is a major military port. Sir Bedivere first saw combat in the Falklands War of 1982, when along with all of the Royal Navy's other amphibious ships, she was sent to recapture the Falkland Islands from an Argentine occupation force. At the start of the war, the ship was at Vancouver, British Columbia, Canada, but started back to Marchwood immediately. After loading at Marchwood, she left for Ascension Island. The ship suffered slight damage on 24 May whilst lying in San Carlos Water, when an Argentine Skyhawk dropped a bomb that glanced off the ship. On 16 November 1982, she returned from the Falklands with the bodies of 64 members of the British Forces (52 soldiers, 11 Royal Marines, and a Chinese laundryman) whose families had wanted their remains returned. The ship deployed to the Persian Gulf in 1991 in support of Operation Granby. In 1994, the ship was modernised in a service life extension programme to give it an extra 15 years. The ship was lengthened by 12 metres, had its superstructure altered to a more modern design, the engines were replaced, and the ship's bow thrusters were changed for more powerful models. After returning to service in 1998, the ship was sent to Sierra Leone in 2000 when the U.K. intervened there. The ship operated as the command vessel for British and American mine countermeasures ships during Operation Telic in 2003. Sir Bedivere left the U.K. in September 2002 for the Mediterranean and operation Argonaut in 2002. She was then diverted to the Persian Gulf accompanied by four British minesweepers. After minesweeping operations were complete, the vessel operated as a troop support ship for the Royal Marines. The ship returned to the U.K. on 29 May 2003, carrying the boats and men of 539 Assault Squadron Royal Marines. In 2006, Sir Bedivere returned from Sierra Leone and its part in Operation Vela. Although originally intended to be used until 2011, Sir Bedivere was decommissioned on 18 February 2008. In December 2008, Sir Bedivere was sold to Brazil, joining her sister ship Sir Galahad. Sir Bedivere was handed over to the Brazilian Navy on 21 May 2009, after a major refit by A&P Group at the Company's ship repair facility in Falmouth, Cornwall. She was commissioned into service with the Brazilian Navy, and renamed NDCC Almirante Saboia (G-25), after a late senior naval officer. Admiral Saboia's widow and other members of the family were present at the handover ceremony. On the 8 June 1982 while preparing to unload soldiers from the Welsh Guards in Port Pleasant, off Fitzroy, together with RFA Sir Tristram, the Sir Galahad was attacked by three A-4 Skyhawks from Argentine Air Force's V Brigada Aérea, each loaded with three 500 lb retarding tail bombs. At approximately 14:00 local time RFA Sir Galahad was hit by two or three bombs and set alight. A total of 48 soldiers and crewman were killed in the explosions and subsequent fire. Her captain, Philip Roberts waited until the last minute to abandon ship and was the last to leave. He was subsequently awarded the DSO for his leadership and courage. Chiu Yiu-Nam, a seaman on RFA Sir Galahad, was awarded the George Medal for rescuing ten men trapped in a fire in the bowels of the ship. BBC television cameras recorded images of Royal Navy helicopters hovering in thick smoke to winch survivors from the burning landing ships. These images were seen around the world (dead link). On 21 June, the hulk was towed out to sea and sunk by HMS Onyx; it is now an official war grave, designated as a protected place under the Protection of Military Remains Act. Guardsman Simon Weston was among the survivors of the attack on Sir Galahad. He suffered 46% burns and his story has been widely reported in television and newspaper coverage. Ten years after Sir Galahad was sunk, Weston was awarded the OBE. Other survivors include the intelligence consultant Crispin Black. 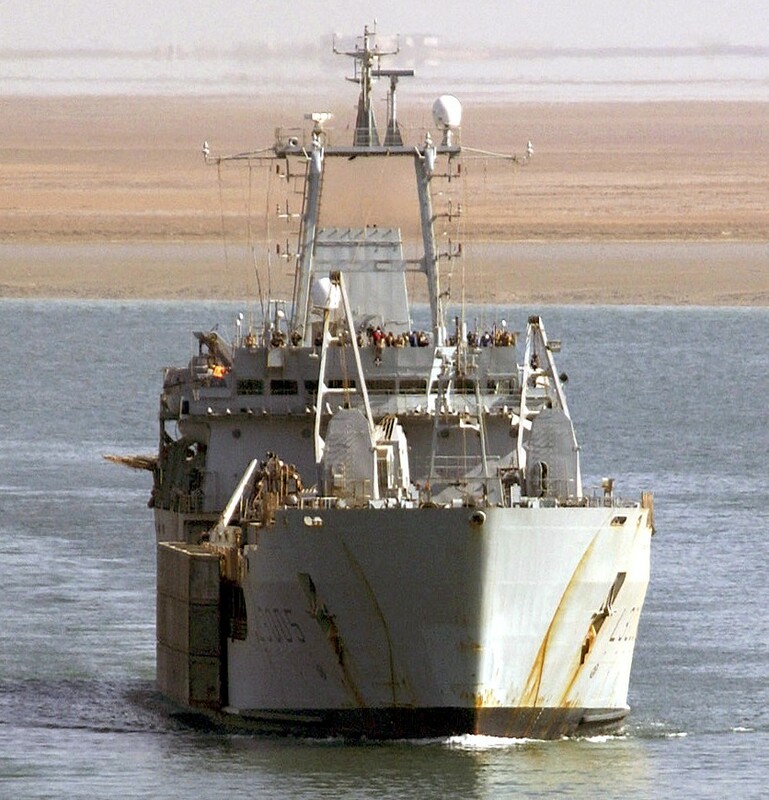 RFA Sir Lancelot (L3029) was the lead ship and prototype of the Round Table class landing ship logistics, an amphibious warfare design operated by the British Armed Forces. Commissioned in 1964, the ship was initially operated by the British-India Steam Navigation Company, then was transferred to the Royal Fleet Auxiliary in 1970. Sir Lancelot was decommissioned and sold in 1989 to the South African company Lowline; she was renamed Lowland Lancer, and was used as a Channel ferry, then a floating casino. The vessel was purchased by the Republic of Singapore Navy in 1992, and was commissioned as RSS Perseverance (L206) in 1994. She was sold again in 2003, to Glenn Defense Marine Asia, which renamed the ship Glenn Braveheart. In early 2008, the ship was sold for breaking up as scrap, and taken to Bangladesh. The ship was initially managed for the British Army by the British-India Steam Navigation Company, then was transferred to the Royal Fleet Auxiliary in 1970. In 1982, as part of the Amphibious Task Group, she entered San Carlos Water on 21 May and uniquely remained there for the duration of the conflict. On the 24 May at around 10:15, she was hit by a 1,000 lb (450 kg) bomb, which failed to explode, from one of four A-4 Skyhawks. This bomb penetrated her starboard side and she was temporarily evacuated pending its removal. Thereafter she remained in San Carlos Water providing accommodation and base facilities to a variety of military units. Following the cessation of hostilities and some repairs, she operated around the Falklands until 26 July, returning to Portsmouth on 18 August. Sir Lancelot was decommissioned on 31 March 1989, and sold in June 1989 to the South African company Lowline, which renamed the vessel Lowland Lancer. She initially operated as a cross-channel ferry on the Weymouth, Dorset to Cherbourg route. This was followed by a spell as the replacement Royal Mail ship while RMS St Helena was undergoing repairs. On arrival in Cape Town, the vessel stayed in South Africa and opened as a floating casino. The ship was sold on in 1992 to the Republic of Singapore Navy, was renamed RSS Perseverance (L206), and was commissioned on 5 May 1994 following a two-year refit. Perseverance was deployed to East Timor as part of the Australian-led INTERFET peacekeeping taskforce from 9 January to 17 February 2000. In December 2003, the ship was sold to Glenn Defense Marine Asia, which renamed the ship Glenn Braveheart. The ship was used as a protection vessel for those ships believed to be under terrorist threat. In early 2008, the ship was sold for breaking. She was taken to Chittagong, Bangladesh, to be broken up for scrap. 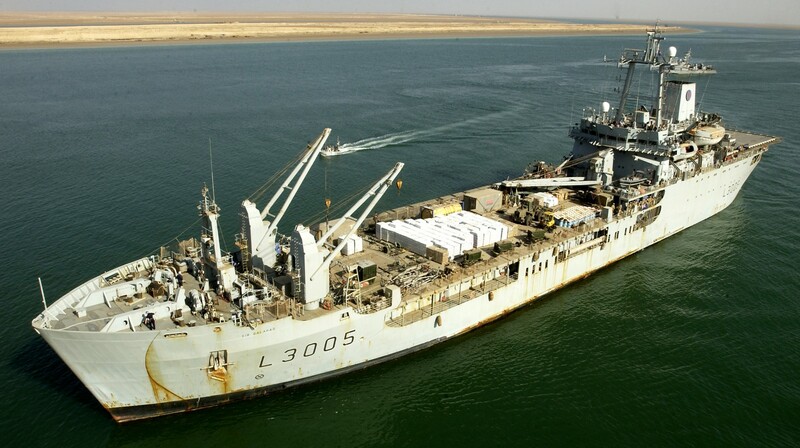 RFA Sir Percivale (L3036) was a Round Table class landing ship logistics. She originally entered British Army service in 1968, managed for the Ministry of Transport by British India Steam Navigation Company, but was taken over by the Royal Fleet Auxiliary along with the other members of the class in 1970. The first twelve years of the ship's life were quiet, with some time spent in the Pacific, until the Falklands War broke out in April 1982. Along with all the Navy's other amphibious assault shipping, Sir Percivale went south to participate in the recapture of the Falkland Islands. She pioneered the supply runs to Teal Inlet and was the first British ship to re-enter Stanley Harbour. Unlike the Sir Galahad, Sir Tristram and Sir Lancelot, the ship emerged unscathed from the conflict. The ship also served in the Gulf War in 1991 and twice deployed to the Adriatic to support British operations in the Balkans. In 1996 Sir Percivale took part in combined exercises with Jordan, followed by Green Wader 96, the first exercise of the then newly formed Amphibious Squadron of the Joint Rapid Deployment Force. In 1997, the ship took part in the large Ocean Wave 97 deployment to the far east and was present for the handover of Hong Kong to the Chinese. Following this ceremony, Sir Percivale escorted the ships of the former Hong Kong Squadron (3 Peacock class patrol vessel) to their new owners in the Philippines. During other parts of Ocean Wave, the ship took Royal Marines to Brunei, Singapore and Thailand for various exercises. 1998 saw further exercises as Sir Percivale took part in practice amphibious assaults in Norway, France and Spain. In 2000, Sir Percivale was deployed to Sierra Leone to support British forces training the army of that country. In September 2000, the ship was alongside in Freetown when British forces who had been taken hostage were rescued in a raid by the Parachute Regiment and the SAS ("Operation Barras"). Since then the ship has been deployed during operations connected with Afghanistan in 2001 and Iraq in 2003. The ship was to have a SLEP overhaul, but an equivalent overhaul of Sir Bedivere proved so costly that plans were abandoned and new ships were procured instead. Sir Percivale was decommissioned on 17 August 2004 and was laid up alongside at Marchwood Military Port, Southampton. Sir Percivale remained at the Sea Mounting Centre (SMC) until 0058hrs, 13 December 2009 when she was towed to Liverpool for scrapping. 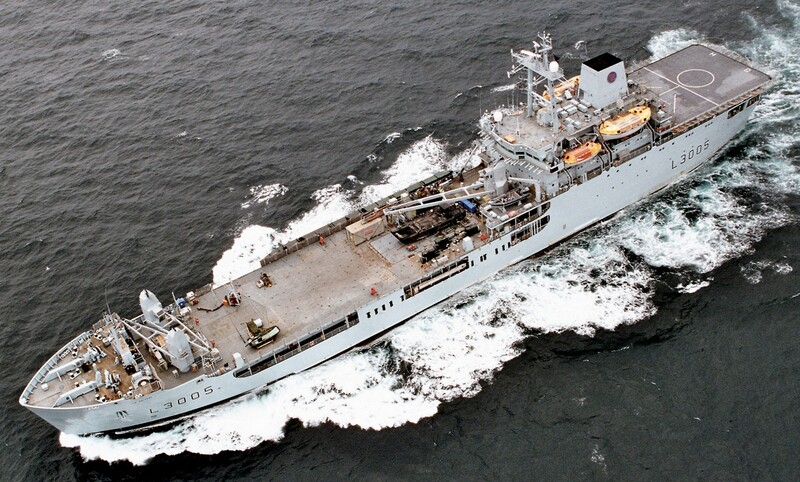 RFA Sir Tristram (L3505) is a Landing Ship Logistics of the Round Table class. She was launched in 1966, and accepted into British Army service in 1967. As with others of her class, she was transferred to the Royal Fleet Auxiliary in 1970. The ship saw service in the Falklands War of 1982, and was badly damaged at Fitzroy on 8 June. In January 1972 RFA Sir Tristram was part of an Anti-invasion task force for British Honduras, together with Sir Bedivere and Sir Geraint. In 1977 RFA Sir Tristram was used as a guest ship for the Queens Silver Jubilee Fleet Review at Spithead in the Solent. In April 1982 RFA Sir Tristram was diverted from Belize to the Falkland Islands to take part in Operation Corporate, the British effort to retake the Falkland Islands. On the 8th of June while transporting men and equipment to Fitzroy Cove alongside the Sir Galahad, Sir Tristram was attacked by A-4 Skyhawks from Argentine Air Force's V Brigada Aérea (FAA), each loaded with three 500 lb retarding tail bombs. At approximately 14:00 local time the decks were strafed and two crew were killed. A 500 lb bomb penetrated the deck, but failed to explode immediately, allowing the remaining crew to be evacuated. Following the later explosion, Sir Tristram was abandoned. Immediately following the end of the conflict, Sir Tristram was used as accommodation by members of 97 Fd Bty (Lawson's Company) Royal Artillery, initially in Fitzroy, and again later after she was towed round and moored in Port Stanley. After the war the hulk was re-floated and towed to Stanley, where she was used as an accommodation ship until 1984. Sir Tristram was then returned to the United Kingdom on a heavy lift ship and extensively rebuilt. Following the rebuild, Sir Tristram re-entered active service in 1985, and saw service in the Gulf War, and the Balkan conflicts of the 1990s. 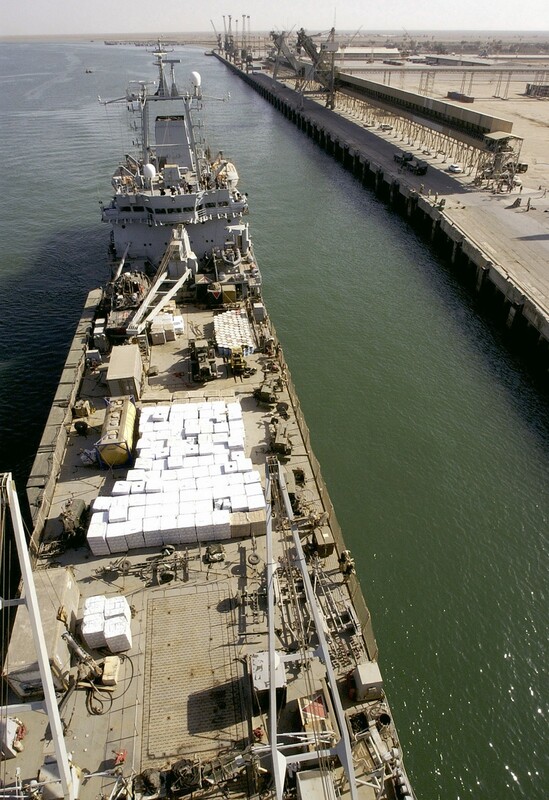 The ship supported relief operations for Hurricane Mitch off Central America. In 2000 the ship was deployed to Sierra Leone in support of British operations there, followed by a cruise to the Baltic Sea in support of MCMVs. Early 2001 saw Sir Tristram return to Sierra Leone to take over from Sir Percivale as the ship supporting British forces ashore there. 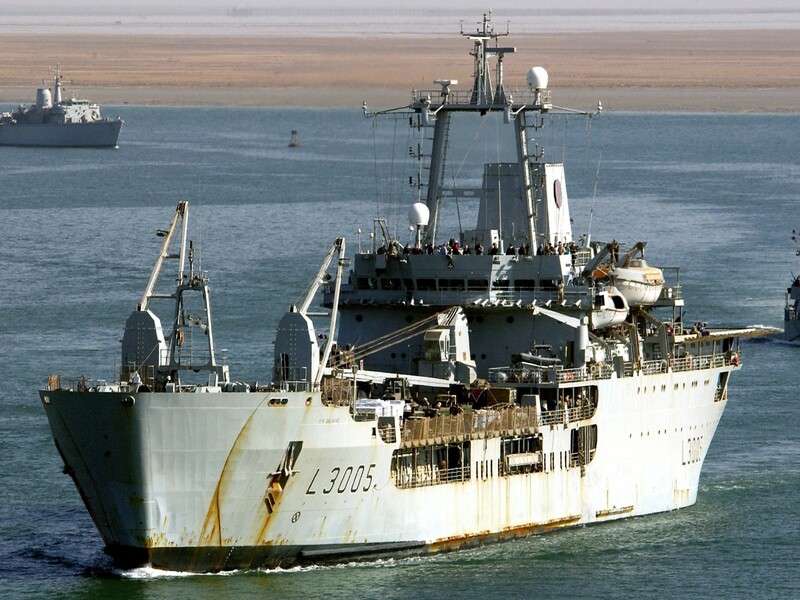 In 2003 the ship was deployed as part of the largest British fleet for 20 years in support of the invasion of Iraq. 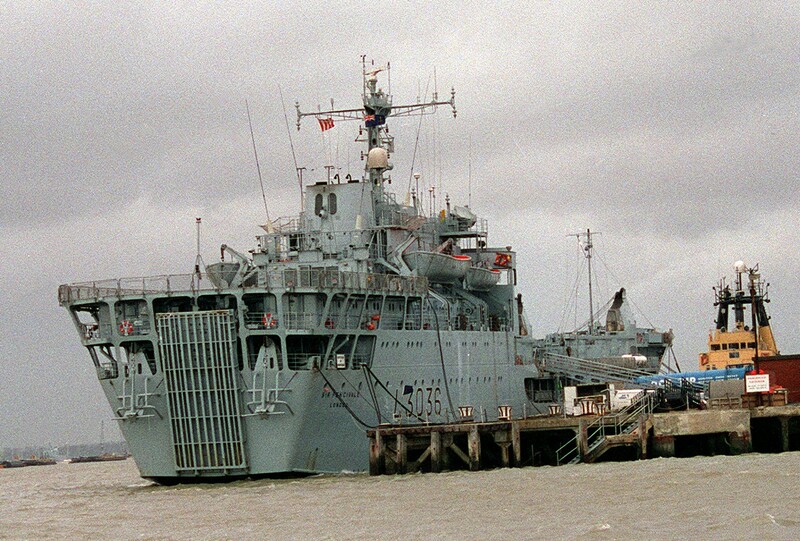 The ship was decommissioned on 17 December 2005 but continues to be used for training purposes by the Special Boat Service and other elements of UK Special Forces Group. 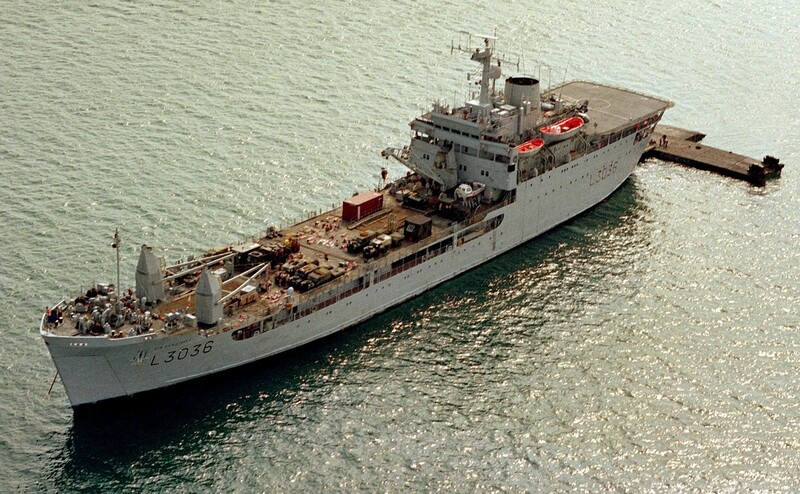 RFA Sir Galahad was built by Swan Hunter and entered service in 1988. She was named and given the identical pennant number to the Sir Galahad sunk in the Falklands War. Built as a combined landing craft and ferry with two flight decks for helicopters and bow and stern doors, there was capacity for around 400 troops and 3,440 tonnes of supplies. She was deployed in 1991 for Operation Granby, 1995 in Angola Operation Chantress and in 2003 for Operation Telic to transport supplies. 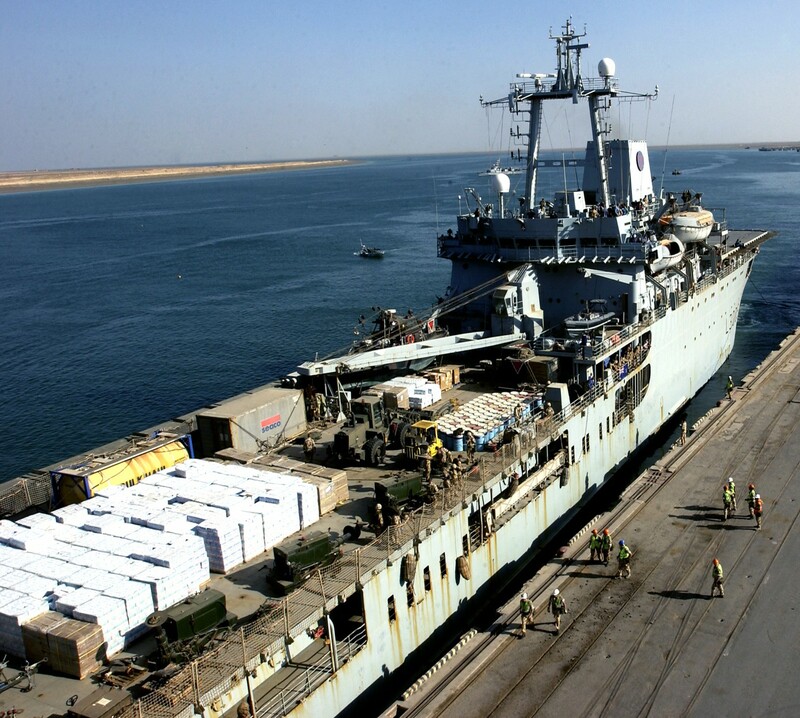 In 2003 Sir Galahad transported humanitarian aid, docking in Umm Qasr Port on 28 March, 2003, after being delayed while naval mines were cleared. On 26 April, 2007, it was announced that she was to be purchased by Brazil. On 20 July, 2006, the ship sailed from Marchwood to Portsmouth, to be decommissioned. She was commissioned into the Brazilian Navy as Garcia D'Avila on 4 December, 2007.